Can you eat raw quinoa? Have you ever wondered if quinoa can be eaten raw? Find out in this note the detail of everything that has to do with quinoa, its preparation and consumption, as well as its nutritional values. Can raw quinoa be eaten? The Quinoa is an Andean pseudocereal, grain, which is rich in complex carbohydrates, but also provides protein. And that is increasingly sought after and consumed throughout the world due to its wonderful properties. But one of the doubts that assault the common consumer is if you can eat raw quinoa. 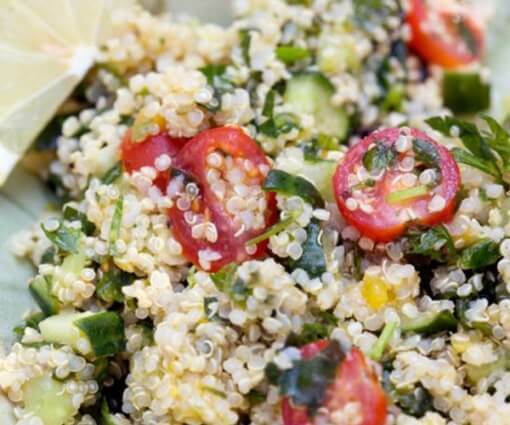 Can you eat raw quinoa? The majority answer is no. It is a really hard grain and needs a pre-cooking. Not enough with a soak. But it is also true that it is a grain. And as such it can germinate. So, if this sprouting process is followed, you can get to eat the raw quinoa. For this, you have to follow the same germination process that you do with any other type of grain. That is, soak a cotton or paper napkin and wait for the outbreaks. Once they are ready, you can consume the sprout quinoa in any dish you like, from a salad to use as decoration. If you find the issue of sprouting or germination of quinoa a bit complicated, you can use the most traditional method of cooking: boiling. Do you want to know how quinoa is cooked? Well, follow these steps. Start by washing the quinoa grains very well, several times. This is to eliminate the saponin that has this pseudocereal. Look closely, because some quinoa are already pre-washed. Then you just have to boil. It will be take about half an hour. The tender grain has to be left and that kind of more whitish circle must be seen outside the grain and more transparent. Ready: that’s it, you know how to prepare quinoa. Do you want to know more about the calories of raw and cooked quinoa? Then you can learn more about this and also everything you need to know about the nutritional value of quinoa. Proteins: 12 grams, among which we can mention amino acids such as: valine, leucine, tyrosine, methionine, isoleucine, phenylalanine, etc. Greases: 6 grams, among which we find monounsaturated fatty acids (oleic, linoleic, etc). Minerals: Zinc, iron, manganese, potassium, calcium, etc. Of course, 100 grams of cooked quinoa are approximately 30 of raw quinoa, so the differences between calories. The nutritional values remain intact and do not vary much between the different types of quinoa.